Heat the butter and half the oil in a large heavy-based frying pan. Cook the onions for 2–3 minutes then add the snow peas and beans. Cook for a further 2–3 minutes, then add the balsamic vinegar and set aside. Wipe the frying pan clean and heat the remainder of the oil. Season the tuna and cook until slightly pink. Add the dragon fruit and cook for 1 minute. 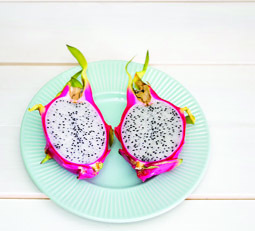 Serve the tuna and dragon fruit on a bed of the bean mix and garnish with fresh lemon wedges.